There are many traditional Japanese shops in Nakamise dori(street) in Asakusa. This street is 250ｍ long and There are over 200 shops. You can buy Japanese goods, Kimono, sweets, foods, Katana, etc here. you can see the big chouchin first. This is the entrance of Nakamise street. Chouchin is a Japanese lantern. At the end of street you can find Sensouji temple. It’s nice to just walk around, sometimes famous people are walking this street. Some shop sell sweets. one of popular sweets the sell is NIngyoyaki. There are many different kinds of Ningyouyaki. Kaminariokoshi and Agemanju is also famous in Asakusa. This is Kaminariokoshi, Kaminariokoshi is made from:glutinous rice, sugar, starch syrup and peanuts. 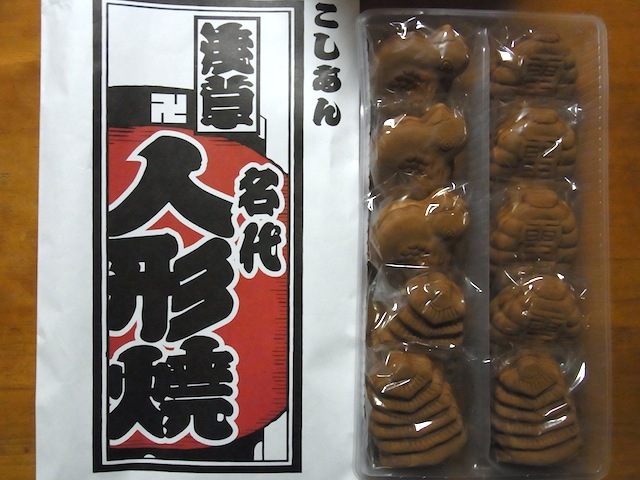 There are many different kinds of Kaminariokoshi and people buy them to give them as souvenir of Asakusa. Agemanju is fried Manju: Manju is Japanese-style bun stuffed with azuki bean paste. There are 4 different flavors:natural, Ume(Japanese apricot), Macha(green tea) and Sesame. you can eat them at the shop or you can buy them and eat them later at your home. There are also Katana shops. some Japanese people and many foreigners want to buy a Katana for decoration. It’s not a real Katana but it looks really close to a real one. Katana prices are over 10000yen. The higher to price the more details and craftsmanship a blade has most of the time. Some katanas have old Samurai clan markings on them. There are different kinds of Katana for example:Oogatana is over 1m and Kogatana is about 40cm, etc. If you like Kimonos or want to try to wear a Kimono, you can buy it at this kimono shop in Asakusa. There are some old Japanese goods shop too. You can buy small shouchins, straps and Manekinekos etc. Manekineko is a cat. this cat makes happy feeling to you. End of this street, There is a temple. This temple name is Sensouji. Sensouji of sensou is same Kanji to Asakusa but different meaning. People have build Sensouji temple over 1300 years ago. This temple is very famous in Tokyo it’s very crowded specially at New Year. You can pray and make wishes at temple. There is a fortune slip here so you can try one time. If you forget to buy some gifts to your family or friends, do not worry. You can buy them on the way back to the station. 3 Picture Perfect Spots Not To Miss in Asakusa! Check Out Hanayashiki Park in Asakusa − Japan’s Oldest Amusement Park!